Draw A Bird Day (September Rewind) Tues. 9/8! Time flies. And so did WordPress, on August 8th, when so many artists honored our feathered friends in their favorite medium. A little birdie wanted you to know that the eighth of September occurs the day after Labor Day here in the US. If you would like to help make WordPress fly once again for the monthly rebroadcast of Draw A Bird Day (brought to our attention in April by M. R. Emberson of A-Wing and A-Way), please post your contribution then. I’ll do a recap of all of the entries once again this month, so no one will miss out on the fun! This little painting was brought to you by the good folks at Derwent and their Inktense line of pencils, along with my Cotman travel watercolor palette. Fly high and free! Peace. Thank you Johanna! Glad you enjoyed it!! Wonderful Laura – like the simplicity in your creativity of the scene. Thank you, Mary. I so enjoyed this one. I’m veering toward abstract realism more and more. I like the color and design freedom it gives me. Glad you like it! Fruit flies like an apple. I’m in! I like your cheery creation. Laura, I see that it has a bit of the abstract freedom you’ve been displaying lately. I really like it. I’m glad, Kirk, as I think I’m starting to find “my style”, if there is such a thing. Thank you! I’m so glad you enjoyed him! Not good. Barely eating, even with appetite booster and anti-nausea drugs. Vet will see her Thursday; may be time to let her go. Great bird! Looks really cool! Thanks, Evan! I’m so glad you like it! Just a few lines that say a lot. Very nice! Thanks, Carmel! I’m liking that “less is more” philosophy. What a happy bird Laura. Beautiful Art. You can count me because Sep 8 is on a Tuesday. Thanks for the reminder. Thank you, Sharon! I’m so glad you’ll be joining us! Did you design the bird in your av, Sharon? Hi Laura…it’s always fun to be apart of the group. What do you mean by “design bird in your av”? Oh, I just meant the artwork of the bird in your picture here on WP. Is it a blackbird? I was wondering if he is one of your creations. She is really beautiful, Sharon. Thank you! I’d like to do more like this. Glad you like it! I really like the “yellow bird of happiness”! 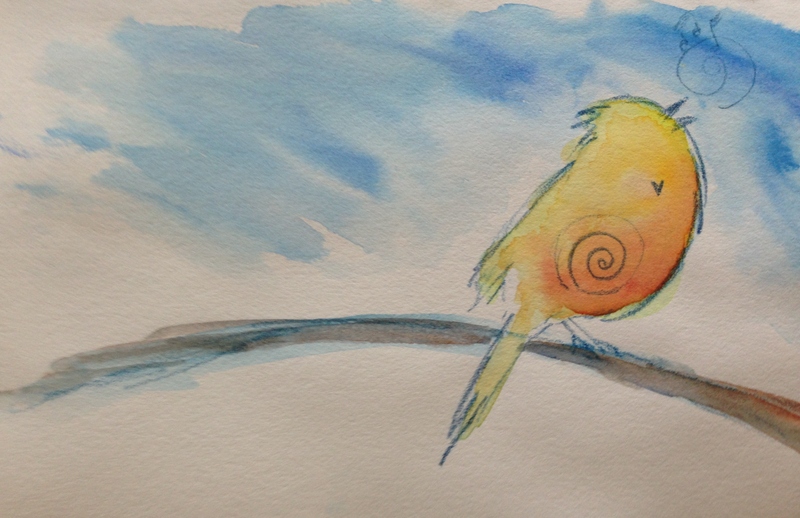 Also, thanks for the link, Laura, and for making Draw a Bird Day a monthly event! I agree, it is super buggy! Glad you like this one. And I’m glad you’ll be in! Ah, thanks, good to know that it´s not only me… 😊 Hope it will get better soon! Oh thank you! I’d like to do more like this one! So glad you like it! …you definitely should 😀 !!! I can’t tell you how cool it is when I make something that really jazzes me and other people really like it too. It’s the happiest feeling ever! Thank you! …it’s because you make other people happy – it all comes back ❤ Thank YOU 🙂 !!! Simply Beautiful…love this bird, there is an emotional quality to it. Made me think of love and hope immediately. Thank you for sharing. Peace. Pretty, sunny bird fellow! Can we post our birds a day early? Sure, go for it, C!